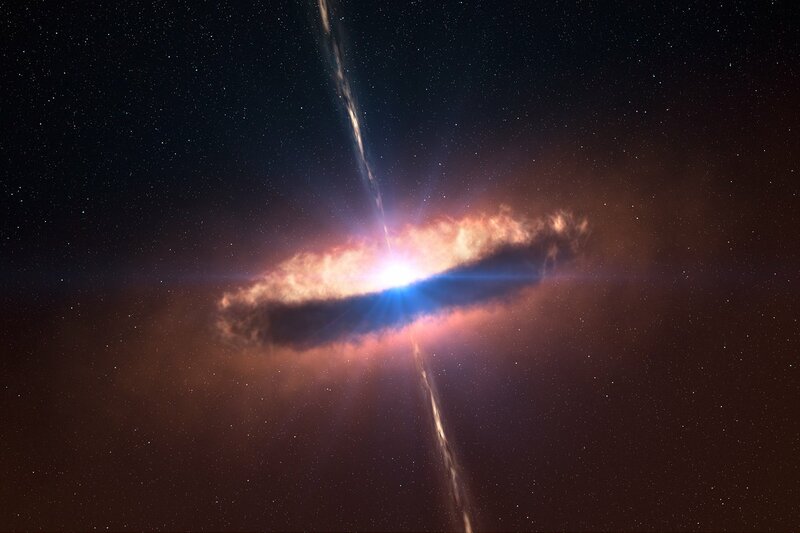 Astronomers have obtained the first image of a dusty disc closely encircling a massive baby star, providing direct evidence that massive stars form in the same way as their smaller brethren. This discovery, made thanks to a combination of ESO’s telescopes, is described in an article in this week’s issue of Nature. The team of astronomers looked at an object known by the cryptic name of IRAS 13481-6124. About twenty times the mass of our Sun and five times its radius, the young central star, which is still surrounded by its pre-natal cocoon, is located in the constellation of Centaurus, about 10 000 light-years away. 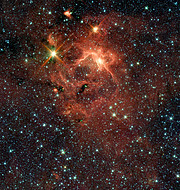 From archival images obtained by the NASA Spitzer Space Telescope as well as from observations done with the APEX 12-metre submillimetre telescope, astronomers discovered the presence of a jet. 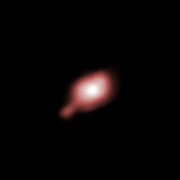 “Such jets are commonly observed around young low-mass stars and generally indicate the presence of a disc,” says Kraus. Circumstellar discs are an essential ingredient in the formation process of low-mass stars such as our Sun. However, it is not known whether such discs are also present during the formation of stars more massive than about ten solar masses, where the strong light emitted might prevent mass falling onto the star. 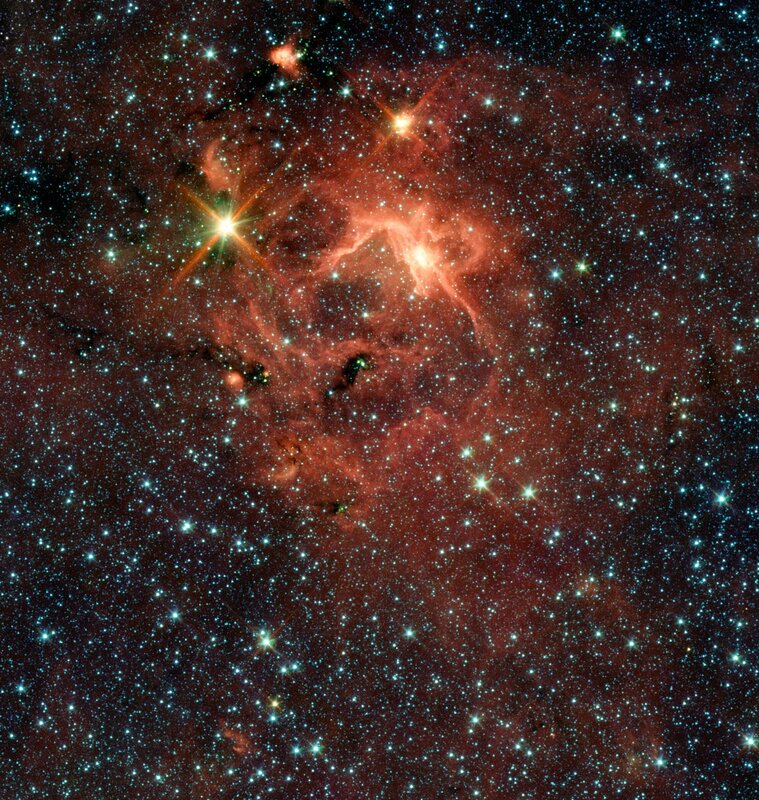 For instance, it has been proposed that massive stars might form when smaller stars merge. In order to discover and understand the properties of this disc, astronomers employed ESO’s Very Large Telescope Interferometer (VLTI). By combining light from three of the VLTI’s 1.8-metre Auxiliary Telescopes with the AMBER instrument, this facility allows astronomers to see details equivalent to those a telescope with a mirror of 85 metres in diameter would see. The resulting resolution is about 2.4 milliarcseconds, which is equivalent to picking out the head of a screw on the International Space Station, or more than ten times the resolution possible with current visible-light telescopes in space. 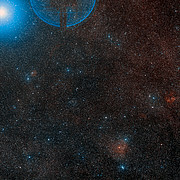 With this unique capability, complemented by observations done with another of ESO’s telescopes, the 3.58-metre New Technology Telescope at La Silla, Kraus and colleagues were able to detect a disc around IRAS 13481-6124. The astronomers conclude that the system is about 60 000 years old, and that the star has reached its final mass. Because of the intense light of the star — 30 000 times more luminous than our Sun — the disc will soon start to evaporate. The flared disc extends to about 130 times the Earth–Sun distance — or 130 astronomical units (AU) — and has a mass similar to that of the star, roughly twenty times the Sun. In addition, the inner parts of the disc are shown to be devoid of dust. “Further observations with the Atacama Large Millimeter/submillimeter Array (ALMA), currently being constructed in Chile, could provide much information on these inner parts, and allow us to better understand how baby massive stars became heavy,” concludes Kraus. This research was presented in a paper to appear in this week issue of Nature (“A hot compact dust disk around a massive young stellar object”, by S. Kraus et al.). The team is composed of Stefan Kraus (University of Michigan, USA), Karl-Heinz Hofmann, Karl M. Menten, Dieter Schertl, Gerd Weigelt, Friedrich Wyrowski, and Anthony Meilland (Max-Planck-Institut für Radioastronomie, Bonn, Germany),Karine Perraut (Laboratoire d'Astrophysique de Grenoble, France), Romain Petrov and Sylvie Robbe-Dubois (Université de Nice Sophia-Antipolis/CNRS/Observatoire de la Côte d’Azur, France), Peter Schilke (Universität zu Köln, Germany), and Leonardo Testi (ESO).